Precious metals futures declined on Monday for a fourth session in a row. Losses ranged from 0.1% for gold to 1.6% for palladium. Gold for June delivery dipped $1.40 to settle at $1,251.50 an ounce on the Comex division of the New York Mercantile Exchange. The settlement was the lowest since April 27 when gold closed at $1,250.40 an ounce. "The prospects of a summer rate hike bolstering the dollar present a substantial headwind for gold, and while there is a lot of support in the mid-$1,200s, the path of least resistance will be lower if the dollar strength continues," MarketWatch quoted analysts for The 7:00’s Report. Gold futures traded from a low of $1,243.50 to a high of $1,256.80. They fell 1.6% last week, their second straight weekly decline. Elsewhere, silver for July delivery turned down 10.9 cents, or 0.7%, to settle at $16.423 an ounce. The settlement was the weakest since April 18 when silver ended at $16.253 an ounce. 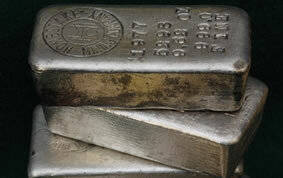 Silver prices ranged from $16.32 to $16.59. Last week, they dived by 3.5% for their third weekly loss in a row. July platinum dropped $10.20, or 1%, to $1,013.10 an ounce, trading between $1,005 and $1,028.40. Palladium for June delivery lost $8.65 to $550.25 an ounce, ranging from $547 to $563.30. Both fell last week, platinum by 2.7% and palladium by 5.7%. Gold declined $8.30, or 0.7%, to $1,245.90 an ounce. Silver declined 25 cents, or 1.5%, to $16.31 an ounce. Last week, London bullion prices registered declines that totaled 0.9% for gold, 3.1% for silver, 1.6% for platinum and 4.2% for palladium. U.S. Mint bullion sales rose by 12,000 ounces in gold coins and by 829,000 ounces in American Silver Eagles. Earlier on Monday, the Mint said it is limiting this week’s sales of Silver Eagle to 1,057,500 coins. The 57,500 portion essentially includes the amount of unsold coins through the previous two weeks. 2016 American Silver Eagles are running at a record pace with 22,771,500 sold, representing a 37.4% increase over those sold through same time in record-breaking year 2015. May gold continue to drop further for the issue price of the next US Mint centennial gold coin tribute issue – the Standing Liberty quarter dollar .25-ounce .9999 fine gold coin! Can I get an Amen collectors!? That’s what i have been waiting for. Hope silver drops too. Silver is going down also slowly. It traded below $17 all day today again & one day earlier this month dropped 63 cents! Gold is on its way down already & the expected Fed interest rate hike in June is looming over gold prices now. Gold is tanking! Like a sinking ship. Down $20 today.